In March, a local club member, Mike Jacobs, passed away after a short battle with lung cancer. He was a very active member that participated in many of the local events, club meetings and annual shows. His model building interests included sci-fi, armor, aircraft, ships, figures, you name it. He was a creative scratch builder with a good eye for details. Mike will be deeply missed. Before his passing Mike let it known he wanted his kit collection be given to our club/club members to be sorted out and shared however we wished. About a month ago we helped his family by cleaning out the basement, packing everything up - kits, supplies, built collection, and storing it at our local hobby shop which has graciously loaned us the space. He had stacks of kit boxes and plastic tubs full of sprues. Mike was an avid scratch builder so most of the contents never matched the kit box and he had a multitude of projects all in various stages. It took us a long time to sort through it and categorize everything and a lot of it is still "It looks cool, but I have no idea what he was trying to do here." There are easily 120+ started models all in various stages, some in boxes, some in bags, some just a collection of parts. We knew what our next club contest would be. Each member was to pick at least one kit (in any condition)and finish it for Mike. 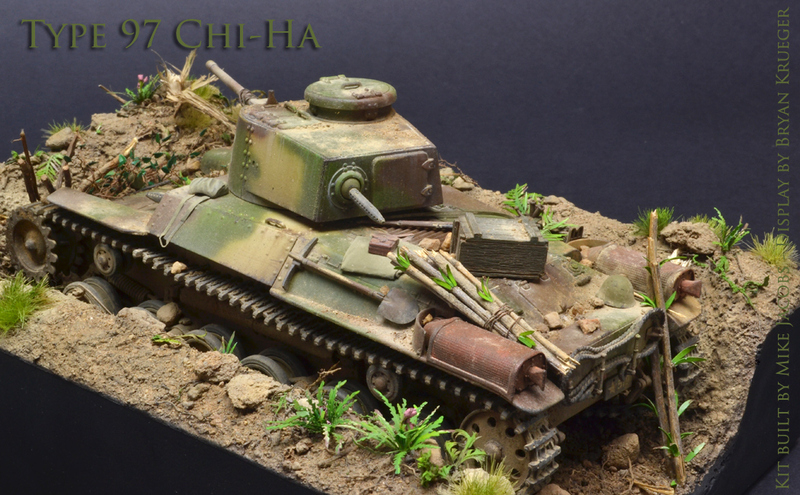 We have until the club IPMS contest in February. One of the models that caught my eye, mixed in amongst a box full of misc. 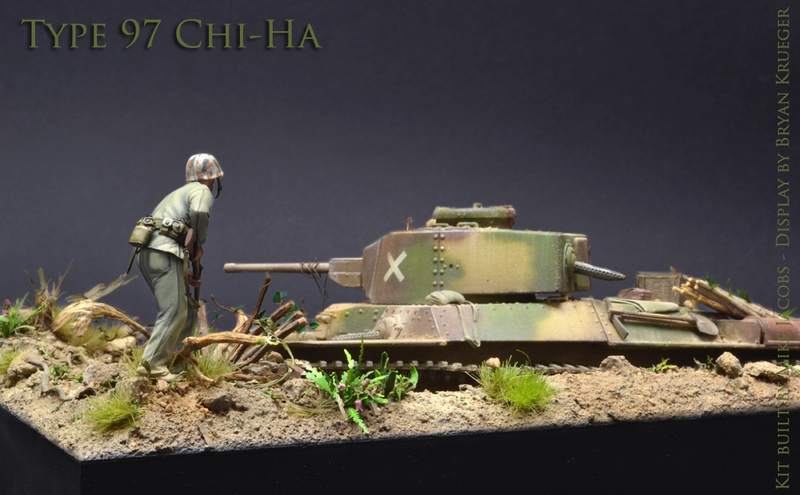 modern armor pieces, was this Tamiya Type 97. The model was mostly assembled with a fine coat of primer and a heavy coat of dust. Digging through the box I found the instructions, tracks, decals, box art, and the unattached tools but not the top MG. It looked like a complete kit and I can't imagine why Mike never finished it. I left Mike's build as is, warts and all, only attaching the missing tools and tracks. He did a nice job of adding missing weld beads and adding texture to the turret plate armor. I didn't know much of anything about this vehicle until a few weeks ago. A furious internet search led me to color profiles, tank history, color development/application, and last battle histories for many of the units. 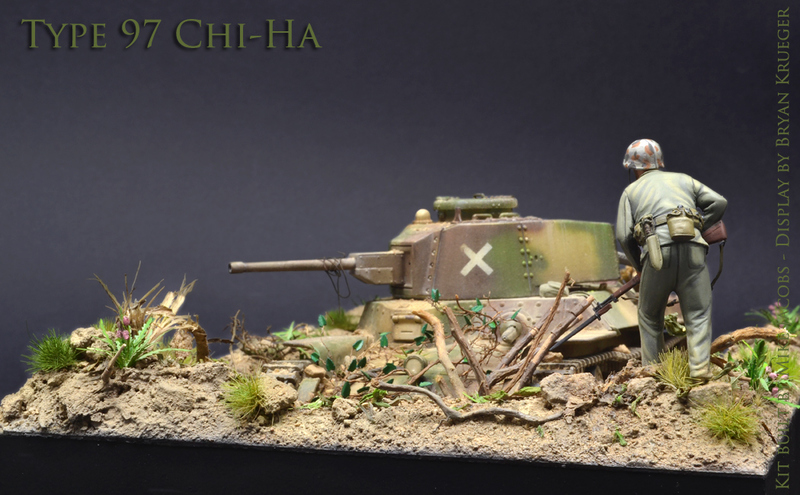 The model represents a vehicle from the 2nd Tank Division, 10th Tank Regiment, Luzon, Philippines, Jan-Feb 1945. 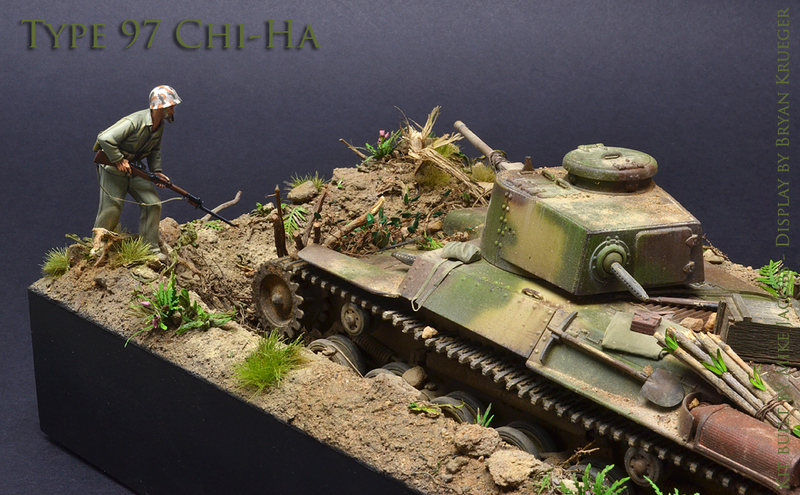 After soaking the model and scrubbing off the dust, the model is painted with Tamiya Acrylics - all custom mixes. Japanese armor is often associated with a hard edge camo with bright yellow strips but by 44-45, this practice was phased out and the camo was sprayed freehand and the yellow stripe eliminated. Variations were allowed for local conditions so I think the schemes are a little more flexible towards the end. The model was weathered with oil paints, enamels and dry pigments. The scene represents an abandoned hull-down vehicle. The Type 97 lacked sufficient armor to withstand hits from the US M4 75mm gun but the 47mm armement was still a formidable weapon against lighter US vehicles and infantry. 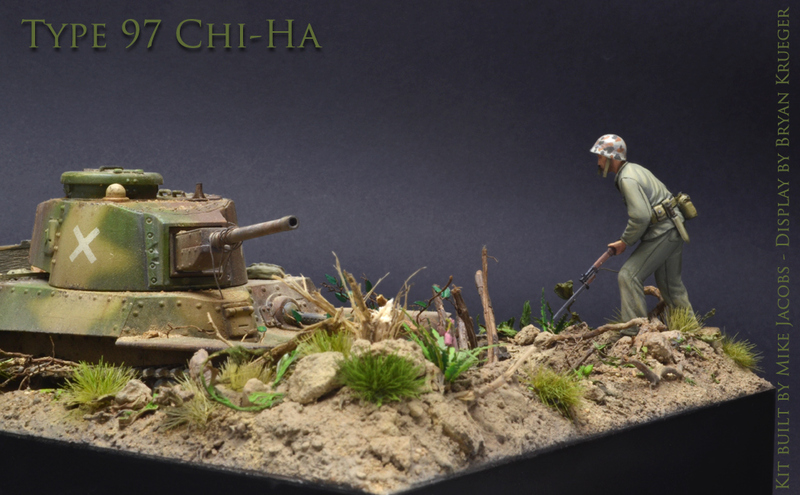 As the Japanese retreated North through the Philippines many of the light and medium tanks were used as static defence to slow down the US advance.